Tretyakov Drive (originally Tretyakovsky Proyezd) is a short street at Kitay Gorod, in the heart of Moscow. It's one of the most expensive streets in the world where exclusive goods from luxury brands: Bently, Ferrari, Bulgari, Armani, Prada, Brioni, Graff, Roberto Cavalli can be found. There is also a beautiful archway onto Tretyakov Drive which is medieval looking. It was always a place where there were private and top class shops first open in late seventies of the XIXth century. There is another historical feature to mark - it's the monument in the middle of the drive which is devoted to the first Russian book printer Ivan Feodorov. 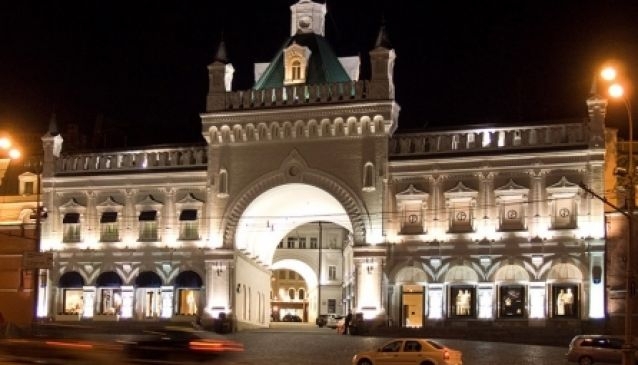 So for a top shopping tour visit Tretyakov Drive where one can choose the most fashionable kids', men's and women's clothes, trendy hats, perfumes, jewellery, evening outfits, stylish bags and accessories. High service, high quality, high street and high price - a perfect place to feel posh and aristocratic. On the street it is seen as perfectly normal to meet famous Russian actors, singers and other celebrities. Feel free to walk around Tretyakov Drive, it's a pedestrian zone. Everyday: 11 am - 10pm.